The biggest challenge for any start-up or growth business is to build awareness – you need to make more people aware of your great brand. The same challenge applies even to the biggest brands of the world when they are launching new products but inevitably they usually have the budgets to do the job. Reaching your target consumer is no easy task when the average person is exposed to 5000 brand messages every day, but there are creative ways to both reach them and cut through the noise. When it comes to spreading the word we usually work up detailed marketing plans, based on who you want to reach, where you can reach them and what you want to say. It might include advertising, PR, PPC, even events – subject to budget of course. But when budgets are tight as they are in start-ups and growth businesses – the most ingenious options come to mind. 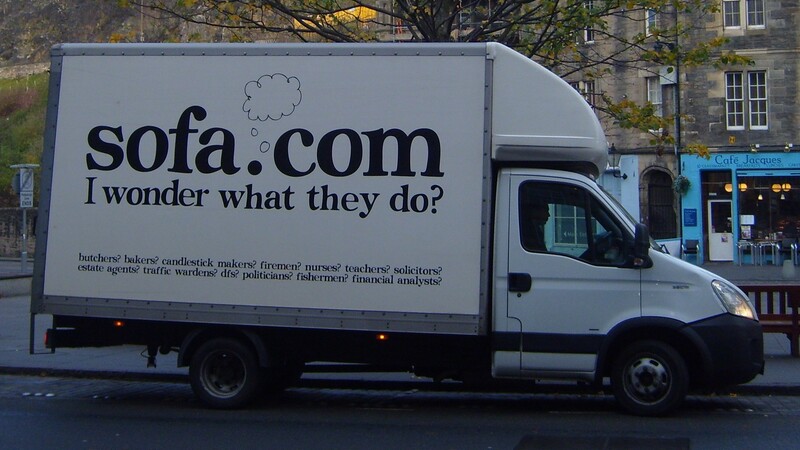 It was a foggy early morning recently that I was reminded of this by a Sofa.com van (click on the image to see the witty copy). In short, they turned my rather grey morning commute on its head by making me laugh out loud at their van. Clearly it really appealed to my slightly quirky sense of humour – but by doing this it had impact and I will inevitably think of them next time we need a sofa. Now ask yourself how many other people have read the side of their van, laughed and will inevitably remember them. Another brand close to my heart builds this brand love on their bottles. Everything on an innocent drinks bottle is tweaked and finessed to express the brand personality, so that whenever a smoothie drinker takes a moment from their busy day to read the small print they come away a little bit brighter. Similarly innocent became renowned for their ‘grassy vans’ that scooted around London in the early days distributing those little bottles – those vans are famous, and would have worked wonders back in the day to drive awareness of what was – only ten years ago – a completely unknown brand. When you think about marketing your brand – don’t get caught up in the lack of budget or fearful of being too out there. You know your brand better than anyone, so have some fun with what you say and look for any place in your business model that touches your consumer and get your message on that, be it the side of a van, bottle, carrier bag or even you! p.s. I’d also like to thank Oliver at sofa.com customer services, who found me these lovely images of their vans within about 5 mins of me emailing with this rather strange request! Superb customer service… clearly delighting customers really does run through the whole of the company. Written by Christina at The Nurture Network: The on-demand marketing department for start-ups and entrepreneurs – making expertise and resource available just when it is needed. Great piece and thanks for featuring our sofa.com vans. We’re delighted that our vans made you laugh! I spend my time working with new businesses and helping them grow. Here I love to write about some of the great, and often unusual, encounters we have along the way!